A great budget range of printed non woven bags suitable for any conference or trade show. Boost brand visibility during conferences and tradeshows without breaking the bank with one of our branded non woven conference bags. Made with quality polypropylene material and available in many practical designs, these promotional bags make really cost-efficient marketing tools. Each style comes with unique features so make sure you check out the entire collection. 80gsm non-woven polypropolene. Black bound seams. One continuous handle extending up from sides. 80gsm non-woven polypropolene. Black bound seams. Front and side slip pockets. Clear plastic card holders on both sides. Adjustable shoulder strap. Baseboard. 80gsm non-woven polyepropylene. Adjustable shoulder strap. Flap is double thickness. Metal stud closure. Bound seams. Organiser under flap. Mobile phone pocket on left side. Business card holder on back. Fully gusseted main compartment with button closure and wide straps. 80mm gusset and 300mm strap/handle. 75gsm non woven document bag, with main zipped compartment and business card window on back. Laminated material is water resistant and hand-wipeable. Fully insulated main compartment. Features: Fold-over top with velcro closure. Open front pocket. Contrast carry handle. The A4 Tote bag is ideal to carry documents. Made from 90gsm non-woven material with two handles. Great for schools and universities. This 90gsm non-woven tote is stylish and affordable, perfect for trade shows, seminars and all your promotional needs. 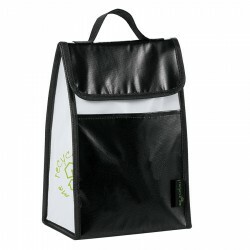 The Trade show carry bag comes in four colours with black trim. 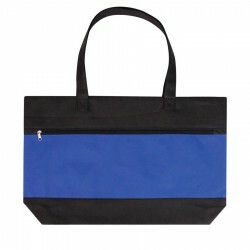 Perfect 90gsm Executive tote style for tradeshows, conventions, and business meetings. Open main compartment with three pen holders on front. A 90 gsm Non-Woven Gift Bag ideal for retail outlet and schools. This bag is compact and durable ensuring a long life span. 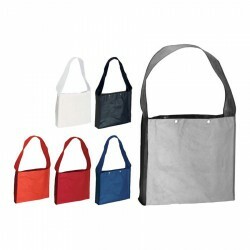 Large Non-Woven Shopping Tote Bags have a large Gusset with base board. This shopping tote has two handles and is ideal to carry groceries. 90 gsm Polypropylene, Bound Seams, Long Handles,Extending up from side. 90 gsm Polypropylene, Bound Seams, Shoulder Strap, Double Layer Flap Over. The Medium Jute Gift Tote Open main compartment with Velcro closure. Double 35cm handles. Disclaimer: Minimum of 32pt. font size. Bold artwork only. No fine graphics or text. *Non Woven Sling Bag - 80gsm. *Features a single wide carry handle. *8cm gusset with two stud closures at the top of the bag. *Good size print area. *Perfect for trade shows.